While this policy has been around since May 2012, a recent bill passed in the Diet (June 2014) has added further immigration provisions to foreign nationals who meet certain criteria. Foreign nationals involved in the above activities can obtain preferential treatment in immigration if they obtain 70 points or more in the calculation matrix (refer to leaflet linked above). And now, the “breaking news”! On 11 June 2014, lawmakers in Japan passed the bill revising the above-mentioned immigration act. 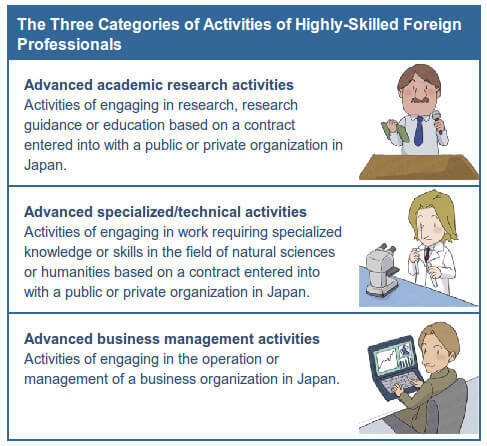 Under the new law, foreign nationals who qualify as highly-skilled labour may be considered for permanent residency after just 3 years of activity in Japan.